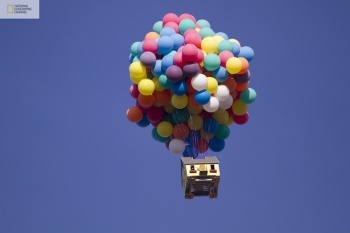 The people at National Geographic know that the best way to prove a balloon-powered flying house is possible is to get a bunch of balloons and build one yourself. The National Geographic Channel, along with a team of engineers and balloon pilots, successfully managed to launch a 16' x 16' x 18' house 10,000 feet in the air on Saturday, where the 10 story tall, 300 balloon construct flew for over an hour. The experiment, modeled on the floating house from Pixar's movie Up! was carried out and filmed for an upcoming show on the National Geographic Channel, entitled How Hard Can It Be? The answer, for a real house, turned out to be "nearly impossible." So instead of attempting to float a real, full-sized and completely furnished home, the team decided to build their own bare-bones house that might actually be capable of flying. The construction took more than a full day of working, even with volunteers, but the balloon-house was finally ready by dawn, when it was finally launched, setting the world record for largest balloon cluster flight ever attempted in the process. How the hell did they get it down?